Easiy Transfer Apps, Music, Photos and More Between PC and iDevice/Android; Download Videos from 100+ Video Sharing Sites and Transfer to iPad/iPhone/iPod/Android; Handy Toolkit: Audio converter, Video converter, Ringtone Maker, etc. Truly useful file-management and transfer application. Using leading antivirus scanners and found it 100% Clean. Syncios to program do transferu plików pomiędzy komputerem a iPodem, iPhonem oraz iPadem. Aplikacja obsługuje wszystkie rodzaje tych urządzeń, także te najnowsze (iOS 7). In fact once I got my music and videos copied to the iPod I didn't want to change anything because that meant using iTunes again. Not any more, Syncios WORKS! It is easy to use and intuitive. Everything is just easier now. If you get frustrated with iTunes you should try Syncios. ITunes has remained very powerful. However, even though millions use it, some still hold some reservations because it brings problems when you want to transfer files from the desktop to the iOS devices. This is where you need the Syncios as an alternative to the file transfer. Syncios is a free app that allow the users to have more control of your device as compared to the iTunes. 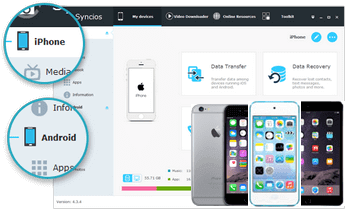 As an iOS manager, Syncios supports accessing any iPod touch, iPhone or iPad to export apps, photos, music, ringtone, videos, and eBooks to your PC for backup. Transfer files from your PC to iOS devices will be also available. I can not thank you more about your product! I wanna move my Samsung Galaxy S5 to my Windows PC. Your program made it fast. Thanks! Thanks to your great software, I can easily manage videos, photos, music, contacts on my HTC now. Good job. I used it to transfer music and photos from PC to my Android. One day, I found it can convert video for Android. So amazing. I like this function.